Item # 305302 Stash Points: 1,499 (?) This is the number of points you get in The Zumiez Stash for purchasing this item. Stash points are redeemable for exclusive rewards only available to Zumiez Stash members. To redeem your points check out the rewards catalog on thestash.zumiez.com. Rothco's military-inspired designs are renowned for their long-lasting wear. The Jungle orange camo bucket hat is a testament to Rothco's attention to detail with it's structured construction and water-resistance. It comes in an orange and black camouflage pattern and is finished with an adjustable chin strap for a convenient fit. 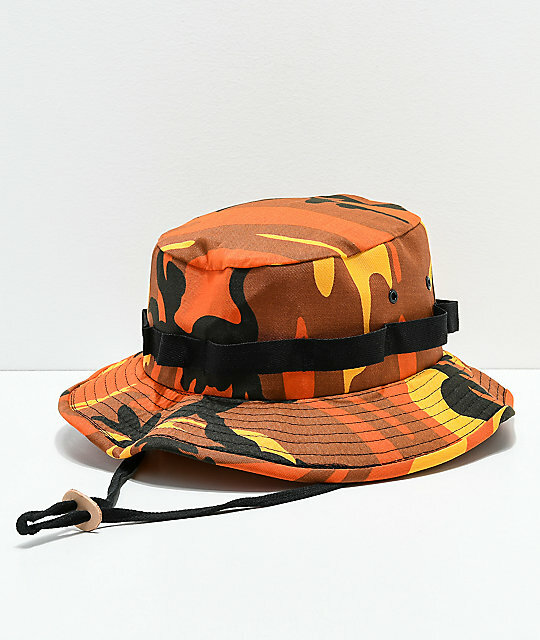 Jungle Orange Camo Bucket Hat from Rothco. Canvas construction with an orange and black camouflage pattern throughout. Woven strap stitched around the crown.